Portable headphone amplifier with two 1/8” headphone jacks that lets two people listen at the same time to the same signal. Many personal digital music players have a limited output for driving high-quality headphones – which may have a higher impedance, a lower pass-band voltage sensitivity or both – but this amplifier has a 2-level gain switch to boost the signal level, so the sound is always crisp and clear. It is ideal for use with virtually all headphones from 16-100 ohms. The sound quality from the typical headphone jack on a portable device or coming from the standard-issue soundcard found in virtually every computer leaves a lot to be desired. The amplifier delivers a marked upgrade in sound quality, compared to just plugging the headphones directly into the unit’s headphone jack. This unit connects easily to any device that has a standard 1/8” output jack. A rotary on/off/volume control makes it easy to operate. The long-lasting built-in rechargeable lithium polymer battery provides several hours of uninterrupted listening enjoyment. There is an LED indicator for power on, battery charge, and low battery indication, and battery charging is done through the convenient micro USB port. Dimensions: 46.7 x 45.7 x 15.2 mm. 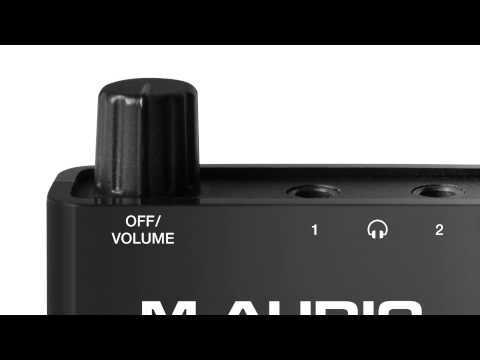 Weight: 30 g.
Do you own M-Audio Bass Traveler or have you had a chance to try it? Praktikus és egyszerű kis szerkezet. Otthoni vagy út közbeni csöndesebb gyakorlogatásra tökéletesen megfelel. A kis Jacknek hála bármilyen fülesre vagy jackes hangfalra rá lehet kötni. Szépen szól, minőségi anyagból van. Egy baja, hogy nincs rajta torzítás, de ez elhanyagolható figyelembe véve a helytakarékosságot és az árat.